When you have a fine woodworking project that you're ready to stain, one option to consider is a gel stain. Gel stains are easy to apply, and you can control the depth of color in your results. While it is messy to work with and has some limitations, it can provide a rich, beautiful color that will show off your woodworking skills. As with any other stain or paint finish, you'll want to be sure to properly sand your project using gradually finer grit sandpapers. It is also a good idea to employ a final hand sanding for a perfect finish. When you're happy with the sanding, vacuum as much sawdust from the entire project as possible. Follow the vacuuming with a tack cloth, though you can also wipe the entire project down with a clean cloth and denatured alcohol to make sure the project is completely clean of sawdust. The denatured alcohol will evaporate quickly and will not discolor the wood. The idea behind a gel stain is to spread it onto the wood in a thick layer for a few minutes and then wipe it off with a clean cloth. Wiping will allow you to control the evenness and depth of color being applied, as the more you wipe away, the lighter the color level of the stain. Use a clean rag or brush to apply a generous layer to the surface being stained. This may feel a little bit like spreading thick ketchup and will appear very uneven, which is fine as long as there is complete coverage. The instructions on the can will tell you how long to leave the stain on the wood before wiping it off. When it is time to wipe off the stain, wear protective gloves, use a clean cloth and wipe with the grain. Focus on evening out the color to the desired level. Keep rotating to a clean spot on your cloth to make sure you are able to even out the color as desired. You might encounter two problems with using gel stains. When wiping off the gel stain, it is very difficult to get the stain out of any nooks or crannies that might exist on your project. 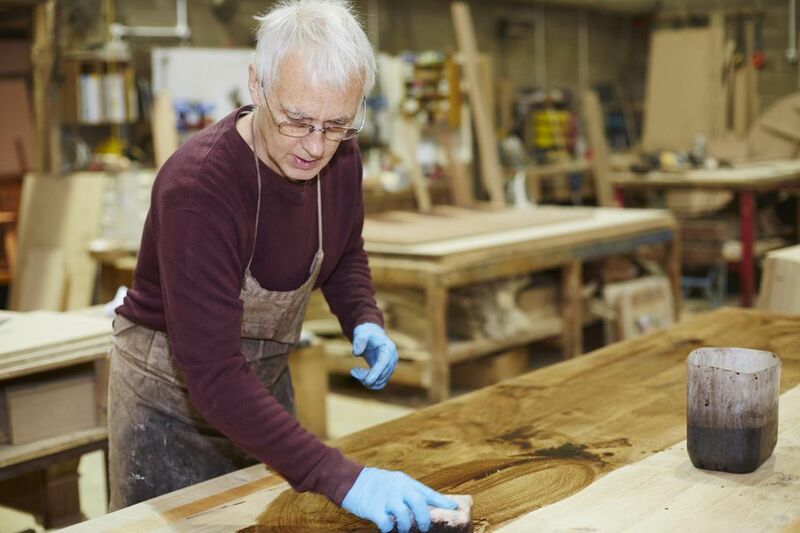 For instance, when applying to a table, you may have difficulty getting the stain out of the junction where the legs or rails meet the table top. If the stain is allowed to remain and dry at this junction, it will be noticeable and more difficult to deal with later. As such, be careful not to over-apply the stain to such intersections. Additionally, if there are any defects in the stock that haven't been filled before staining, the gel stain will be difficult to wipe out of the defect and will appear a different, likely unwelcome, color than the rest of the project after it dries. Be sure to have adequate ventilation when working with gel stains, as they contain materials that give off toxic fumes. Also make certain to discard the cloth that you use properly, as the gel stain is quite flammable.